This photo is what happens when we forget to bring a real camera. 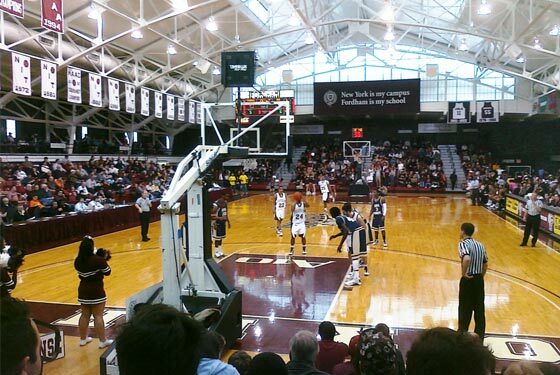 On Saturday, our tour of the city's college hoops venues made its way north to Fordham's Rose Hill Gym, where the Rams battled Atlantic 10 foe George Washington. It did not go well for the Rams. In one of their last realistic chances to grab their first conference win of the season, Fordham looked overmatched by a Colonials team that had just two conference wins themselves coming into the game. A 78–53 loss to Temple or Richmond or Xavier isn't so bad. A 78–53 loss to G.W. is rock bottom. On the bright side, our NYC College Hoops Road Trip actually involved driving to the game in an automobile for the first time all year, which makes it feel, at least to us, considerably more road trip–y. As a reminder, the winner of this contest receives a print-out of the blog post and two sticks of butter. And with that, on to the scoring. Facilities. Whatever thoughts you might have about the basketball being played inside it, Rose Hill Gym is without question a must-see for any college-basketball fan. Obviously, it has its ghosts: It's the second oldest gym in Division I-A currently in use, and Lew Alcindor played his final high-school game there. Built stone-by-stone almost 100 years ago, it has the feel of the Palestra, an old-time gym that existed in an age before recruiting visits and shoe contracts. Sometimes the stone structure can make you feel like you're watching a game in a furnace, particularly because it's incredibly hot inside. It's a lovely, lovely place, and it's a shame that Fordham is the team that plays there. Plus, there's a bar downstairs, Dagger John's, where you can grab booze and a burger beforehand ... and all the alcohol you'll surely need afterward. Score: 9/10. Quality of Play. About that actual basketball: We knew, considering they were 2–20 coming in, that Fordham wasn't very good. We'd seen them at the Garden earlier this year, and even though they lost, they at least looked like an actual college-basketball team. Not Saturday. Saturday they looked like they were ready for this darned season to just END already. They're not just awful: They're undisciplined, lethargic, disorganized, and grumpy. Interim coach Jared Grasso looked flummoxed, exasperated, exhausted. Every few years, Fordham basketball bottoms out, and they're certainly there now. George Washington isn't a particularly skilled team, but they manhandled the Rams with frightening ease. Fordham is the worst team in the Atlantic 10, but we're pretty certain they'd be the worst team in just about any conference in America. Score: 2/10. School Spirit. By some margin, this was not just the most crowded game we've attended thus far, but the one that featured the most students wearing their school's colors. (It was also, to this point, the school with the most readily available merchandise, if you know to walk past the ticket counter in the student center to the bookstore not far from the arena entrance. These points are likely related.) There's a mascot, cheerleaders, and a band (although a band that's smaller than Joe remembers it being when he attended Fordham), plus a rock-solid fight song that's wasted on this year's squad. Still, this team was two and freaking twenty, and drew 2,634 fans on Saturday — more than 80 percent of capacity. Score: 8/10. Coziness. With 3,200 seats, Rose Hill Gym is the smallest arena in the Atlantic 10, which hurts the basketball program in almost every way except for their score in this slice of our rankings. Even the worst seat in the house isn't bad, and there's something very pleasant about a venue that lets in natural light. Score: 7/10. Miscellaneous. Fordham gets points on our scorecard for being the first venue we've visited to refrain from playing Jay-Z's ubiquitous "Empire State of Mind." (We fully expected to go eight for eight.) But Fordham loses a point for featuring Jio Fontan — who left the school in December to transfer to USC — on the cover of its game program. We're also deducting a point because Joe is writing this part, and he's sure he's subconsciously biased towards his alma mater. Score: 3/10. FINAL SCORE: 29. The atmosphere in the gym makes up for the disaster on the court, and it also makes Fordham the leader in the clubhouse as we enter the busy final stretch of our tour. Next up: Manhattan versus Fairfield at Draddy Gymnasium, a game we attended last night and will be recapping tomorrow.